Facilitated by: Alex Wilson, Founder of Building Green and the Resilient Design Institute and Bob Stevens of Stevens and Associates. Downtown Brattleboro has experienced two major disasters in the past three years. Between the floodwaters of Hurricane Irene and the disastrous flames of the Brooks House fire, Brattleboro is in need of a forum for resilient design. Friday morning’s breakout session in the community conference room of the new Brattleboro Food Co-op was the perfect place to learn about the measures that were already in place and plans for the future to expand and preserve our historical downtown. The session began with Alex Wilson’s definition of Resilient Design and introduction of his new creation, The Resilient Design Institute. In his beginning remarks he outlined the 9 points of Resilient Design. These ideas include the concept that resilient design is not always allied with sustainable design, which might be hard to swallow for people primarily concerned about the sensitivity of building methods — and their effect on climate change. What may be in place to support resiliency may not be considered sustainable building practices. 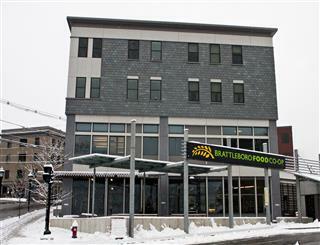 The new Brattleboro Food Co-op building faces the street and contains affordable housing units above it. Bob Stevens took over the session to present some concrete applications of what Mr. Wilson had discussed. First we saw the Brattleboro Food Co-op, our local grocery store and cooperative that out grew its previous building. Stevens and Associates flipped the building and the parking; relocating the building to have street frontage and moved the parking to the back of the lot. This creates a flood buffer to the adjacent Whetstone Brook. The new building not only gave the Co-op the option to expand, but working in conjunction with a local developer and the Windham Housing Trust allowed the creation of a multi-story building with much needed low income housing for the community. This was a perfect collaboration of resources. Next, Mr. Stevens described and showed the plans for the long awaited renovations to the historic Brooks House, two years after the flames and fire hoses destroyed most of the interior of this four to five-story building. With a mixed source of funding and historic building requirements, this downtown fixture will begin reconstruction in a month or so. In contrast to the Food Co-op project, the Brooks House must employ historic preservation building practices. Specifically, in order to both preserve the existing windows and achieve energy efficiency (with a high R-value), this program calls for a new energy efficient window to be placed behind the original window. This is an example of where sustainability, historical preservation and resilience must come together and compromise to keep the look of the building (and provide needed tax credits). The Town of Brattleboro and its Downtown need this building to fully recover from its recent disasters. If that means adding newer infrastructure behind the old to increase the building resilience and sustainability than so be it.